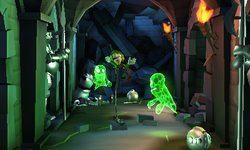 The Guard Tunnel (Guarded Tunnel in the PAL-version) is a room in Treacherous Mansion in Luigi's Mansion: Dark Moon. Accessible from the Bottom of Well to the west and the Cliffside to the east, it's an underground passageway lined with suits of armour that plays an important part in mission E-1. In Front-Door Key, the Guard Tunnel is visited by Luigi in his chase after the Polterpup that has stolen the mansion's front door key. When he tries to pull down the right wall with the vine here, he has to fight some Strong Greenies and Strong Slammers to continue his journey. The Strong Greenies will arm themselves with helmets and swords unless Luigi moves them into the Bottom of Well with the Poltergust 5000 prior to triggering the fight. In the other missions aside from Terrifying Invasion, the Guard Tunnel is unable to be visited along with most of Treacherous Mansion's basement. This page was last edited on September 24, 2017, at 03:29.